If you like your love stories with a touch of the grotesque, graphic artist and film auteur Neil Gaiman and his wife Amanda Palmer have just the ticket for your Valentine&apos;s Day. 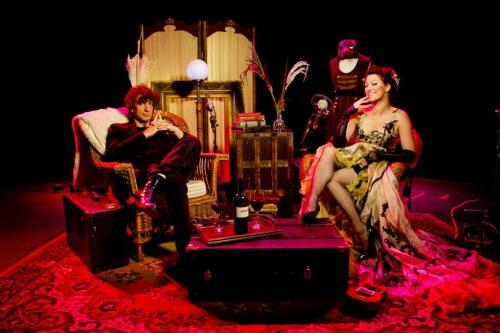 Gaiman and Palmer -- he of "Coraline" and "Sandman" fame, she of the Dresden Dolls and Grand Theft Orchestra -- will will bring their new show "Amanda Palmer & Neil Gaiman present Heartbreak Hotel" to the Tampa Theatre, the 1926 gem of a playhouse on in the heart of downtown. Doors open at 7 p.m, Feb. 14. Gaiman and Palmer take the stage at 8 p.m. for a special "one-night stand" of music and stories. Our friends at the Tampa Theatre describe the show as "the most heartbreaking work the duo has ever made." They also promise "some lovey stuff, too." Couples are, the theater folks note, "hesitantly welcomed." Gaiman and Palmer have been married since 2010. Palmer is a singer, playwright, blogger and pianist who, our friends at Tampa Theatre say, "simultaneously embraces and explodes traditional frameworks of music, theater and art." The show is being put on by Tampa Theatre and Soulshine Music. Tickets are $40-50 (not counting service fees). They go on sale at the Tampa Theatre box office, 711 N. Franklin St., Tampa, at noon Friday, Jan. 23. You can also find them online here. For $200, you can buy one of the limited "meet & greet" tickets and press the flesh with Palmer and Gaiman.